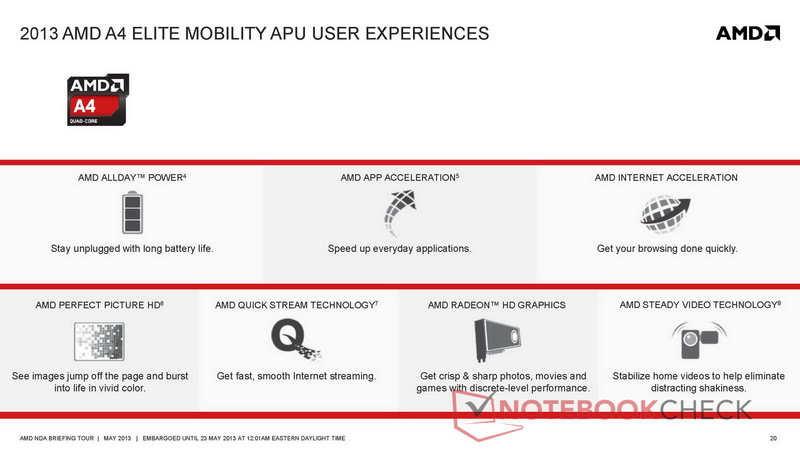 Formerly going by their codenames Kabini and Temash, AMD is officially renaming its new APUs ‘2013 AMD Mainstream APU’ and ‘2013 AMD Elite Mobility APU’ respectively. Top-of-the-line AMD A-Series APUs with A8 and A10 models thus far codenamed Richland are now being referred to as ‘2013 AMD Elite Performance APUs’. 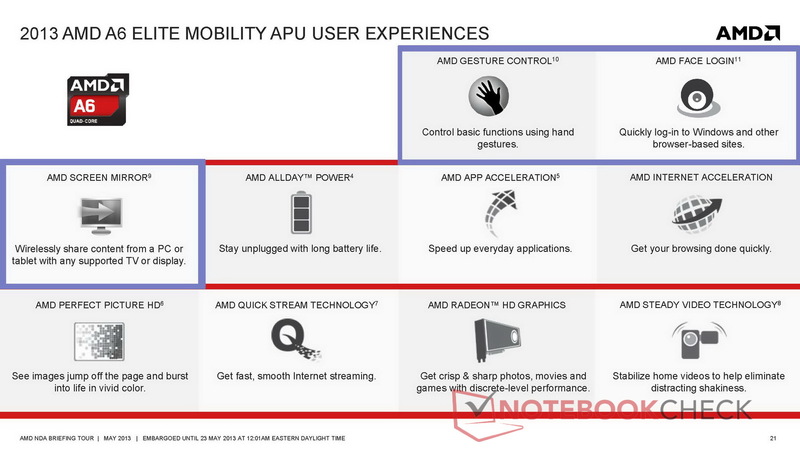 ‘More power with less fuel consumption’ appears to be AMD’s motto for processors going into next generation mobile computing devices. 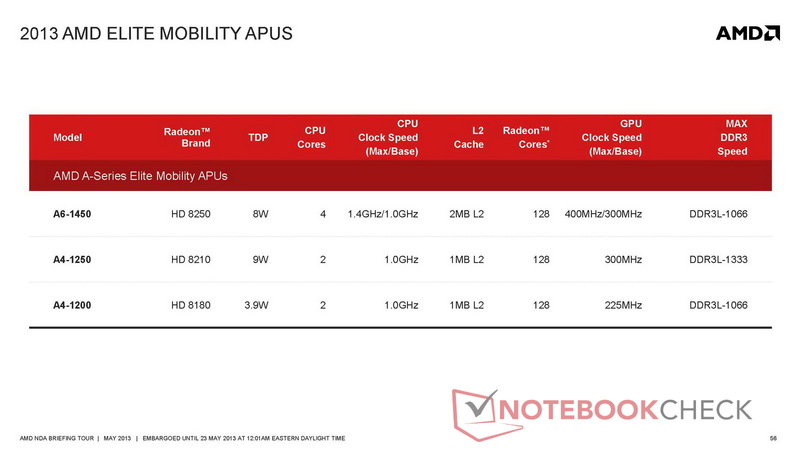 The new APUs are designed for entry-level and small form factor touch notebooks, tablets, hybrid devices, and premium ultrathin notebooks. 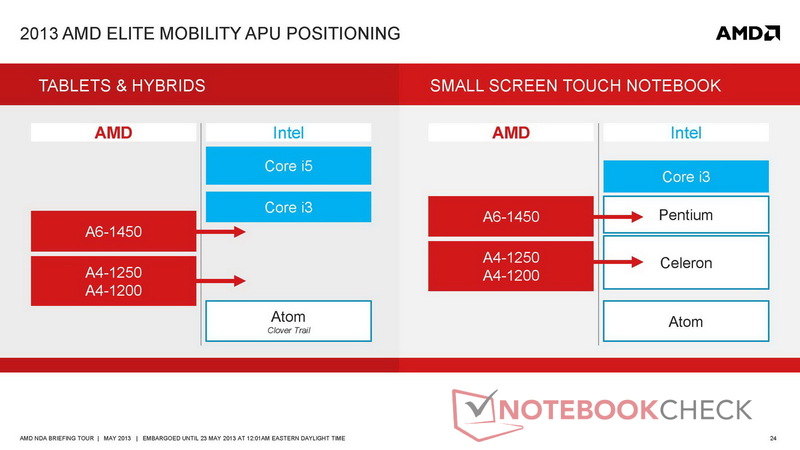 Many of AMD’s new APUs are positioned to fill the gap between tablets and conventional 13 to 15-inch notebooks. 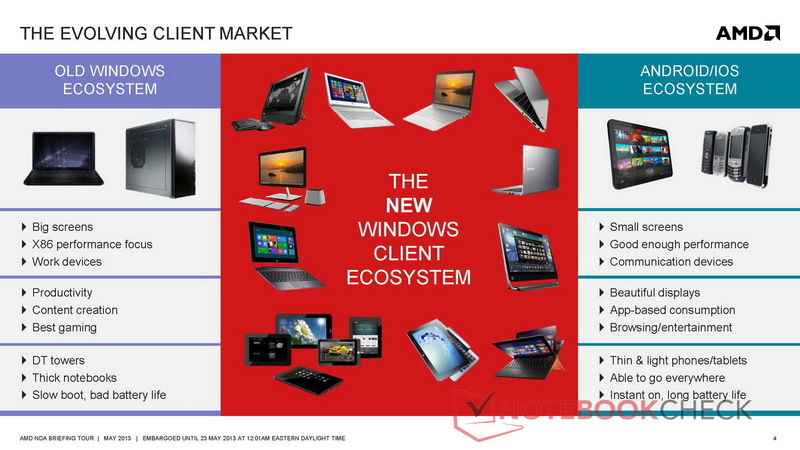 However, it also looks like the company is particularly interested in slotting Kabini and Temash into the booming device market of powerful tablets and hybrid ultraportable notebooks with touch screens. For a taster of how well AMD manages to live up to the company’s own high expectations check out our test of the Temash A6-1450 APU. The test device is an Acer Aspire V5-122P 11.6-inch subnotebook whose SoC integrates a Radeon HD 8250 GPU. You will also find a short test for the Kabini A4-5000 APU here. 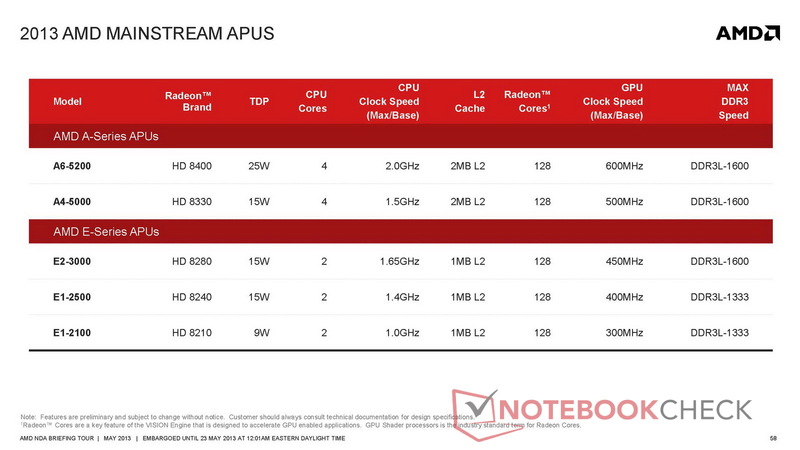 AMD describes its new APUs (Kabini for notebooks and Temash for tablets) as a ‘true SoC design’, since the memory controllers (single-channel, DDR3-1600) and Southbridge are both integrated. Kabini and Temash are both based on the same chip architecture and are the successors of Hondo, Zacate, and Ontario. The new Jaguar-based dual and quad-core CPUs are up 20 percent faster than their predecessor, Bobcat. 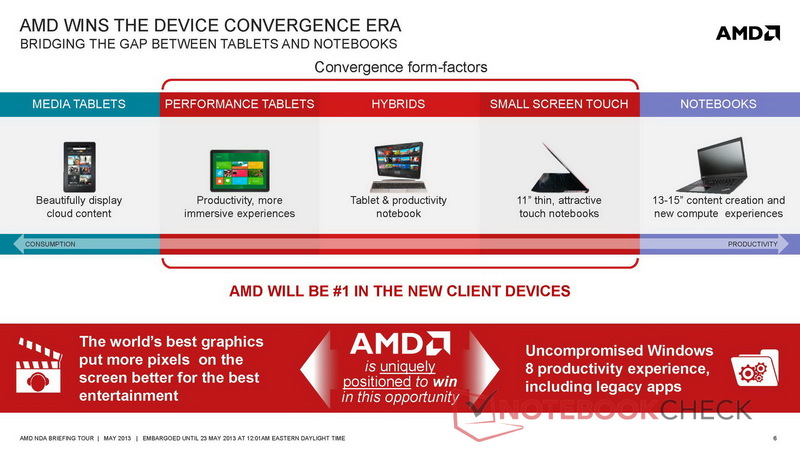 Tablets with an A6-1450 APU can also enjoy up to a 40 percent performance boost when used in conjunction with AMD’s Turbo Dock. 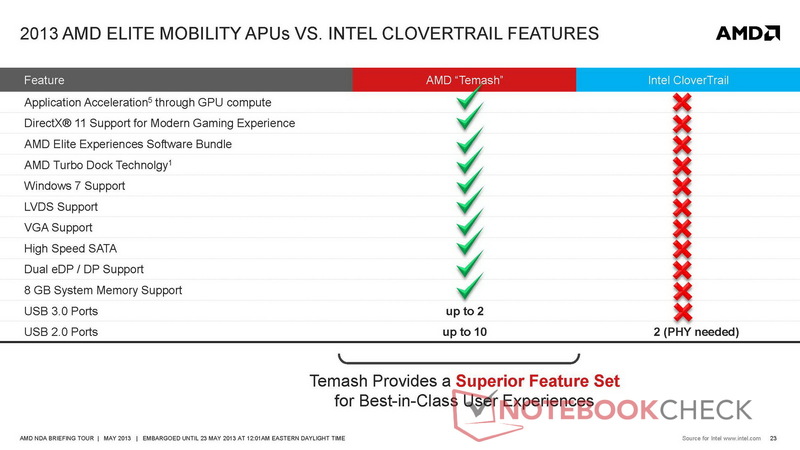 Temash also supports up to 2x USB 3.0 ports and up to 10x USB 2.0 ports. 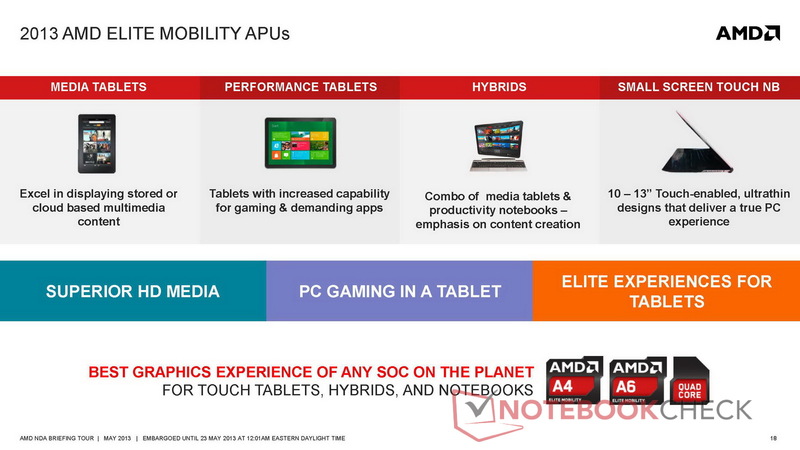 AMD has positioned its Elite Mobility A4-1200 (HD 8180), A4-1250 (HD 8210), and A6-1450 (HD 8250) APUs for tablets and hybrids, between Intel's Atom SoCs and Core i3. 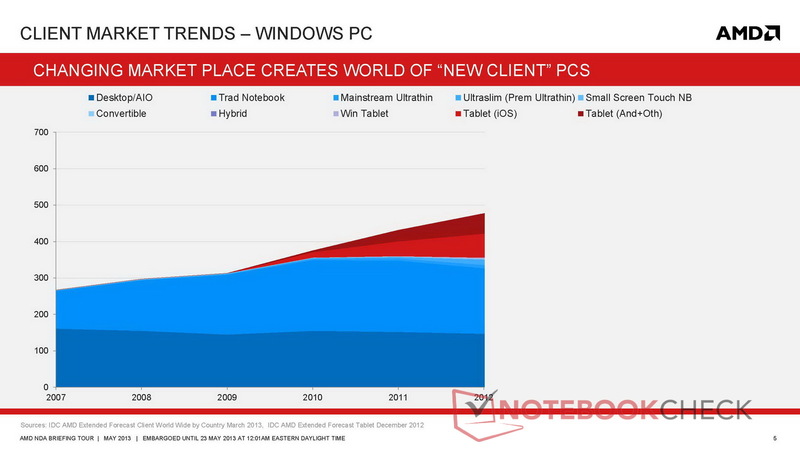 On the notebook front, Temash is gunning for Intel’s Celeron and Pentium processors. 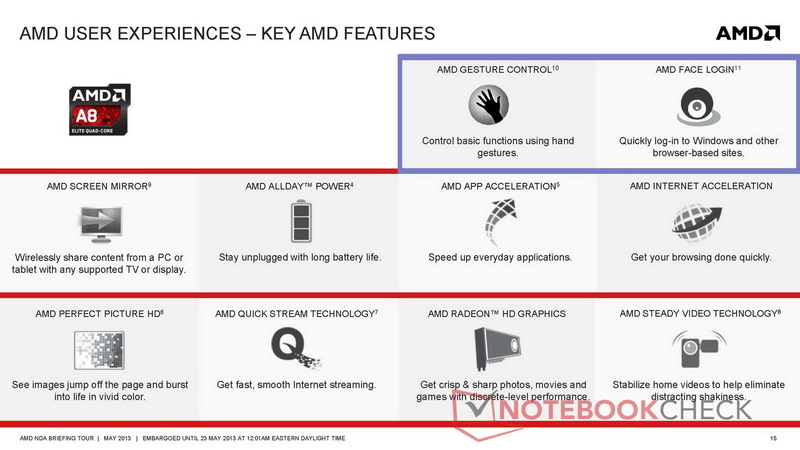 AMD’s Mainstream APU (formerly codenamed “Kabini”) will address small screen touch-enabled notebook designs as well as entry-level notebooks. With TDPs from 9 to 25 Watts the new APUs provide manufacturers with ‘best-in-class graphics and first-in-class x86 quad-core SoC’. Kabini APUs consist of the A-Series A4-5000 (HD 8330) and A6-5200 (HD 8400), and the E-Series E1-2100 (HD 8210), E1-2500 (HD 8240) and E2-3000 (HD 8280). A-Series parts are quad-core, while all E-Series parts are dual-core. 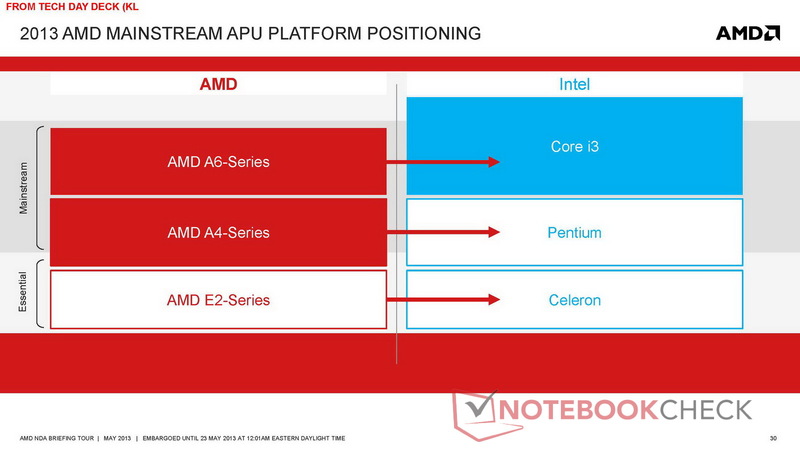 The A6 APUs are expected to directly compete with current Intel Core i3 offerings, while the A4 series goes up against Intel’s Pentium line-up, and AMD's E2 APUs which should outpace Intel’s Celeron silicon. 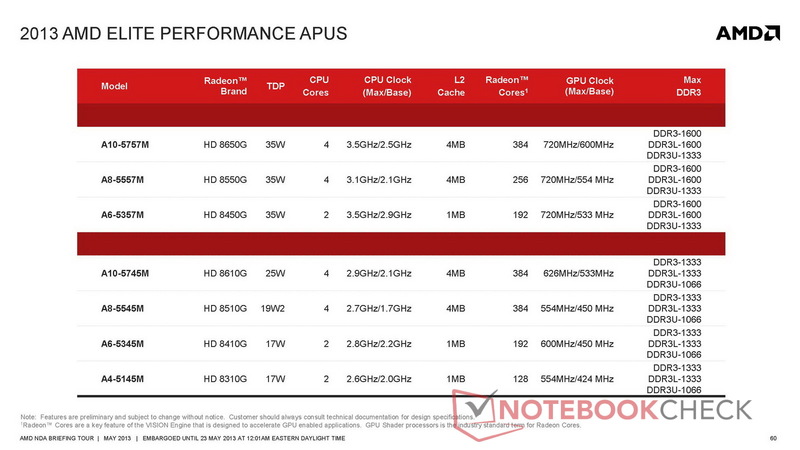 In addition to Kabini and Temash, AMD is now offering a total of 7 new Elite Performance APUs (formerly codenamed “Richland”) that according to the company “offer the best graphics and compute in a performance APU for premium ultrathin notebooks”. Richland APUs were announced more than a couple of months ago and currently consist of three 35W parts (the A10-5757M, A8-5557M and A6-5357M) and 4 new ULV APUs (A10-5745M, A8-5545M, A6-5345M and A4-5145M). 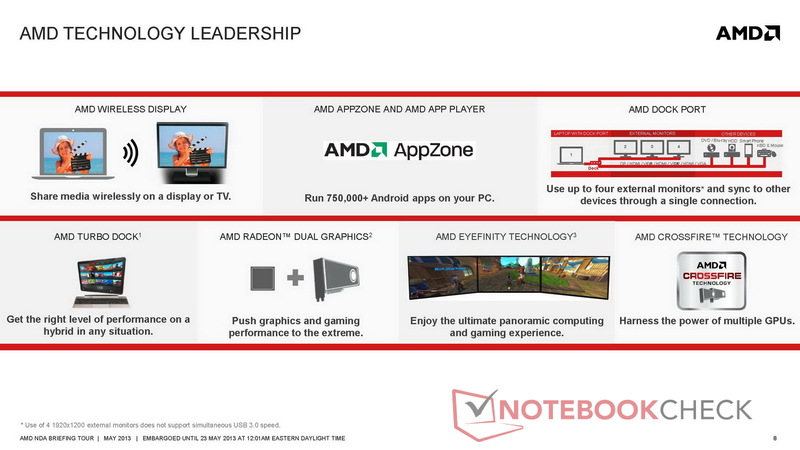 New, low power versions of the 2013 AMD Elite Performance APU (formerly codenamed “Richland”) - offer the best graphics and compute in a performance APU for premium ultrathin notebooks. 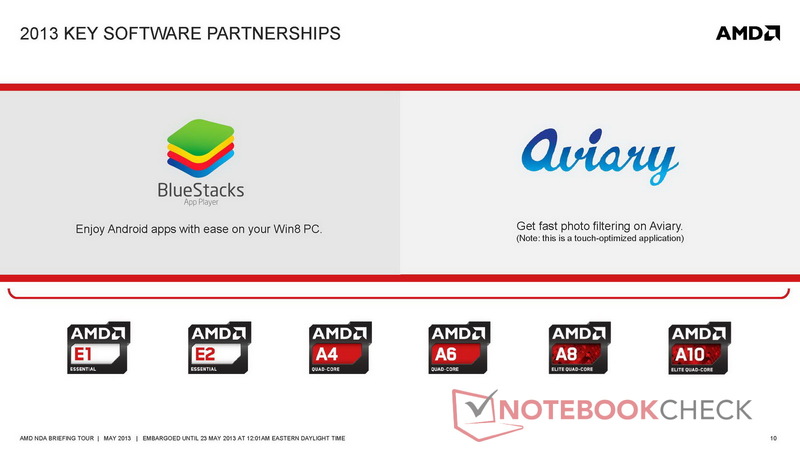 These new APUs are designed to effectively balance the needs of a wide range of new and traditional mobile PC users and are available beginning today from the world’s top computer manufacturers, including products announced today from Acer and HP. 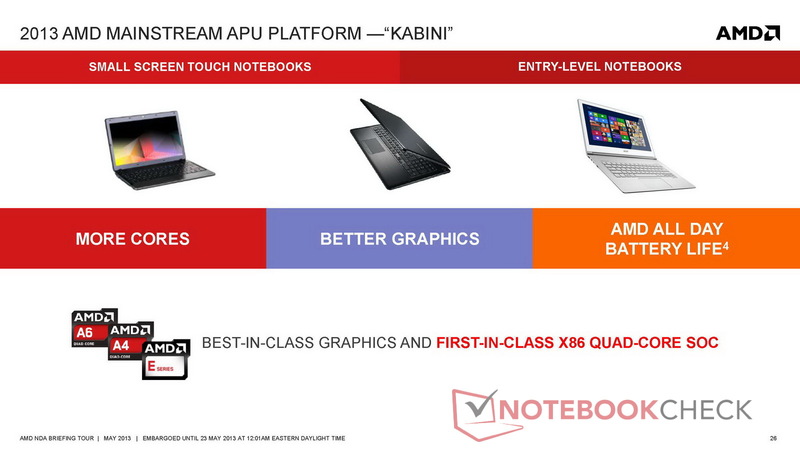 World’s first 28nm, quad-core x86 SoC APU, delivers the best graphics experience of any SoC on the planet for touch small form-factor notebooks, tablets and hybrids, 13-inches and below, enabling a superior HD media experience and high-end gaming. 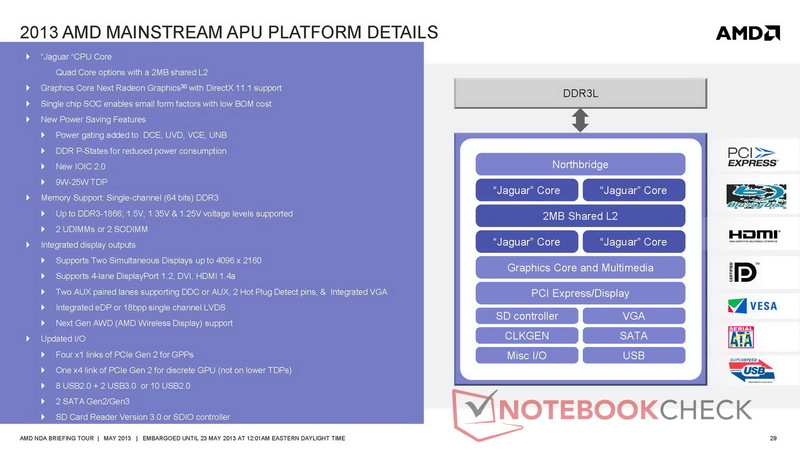 Available as AMD A-Series APUs, this new platform comes in dual (A4) and quad-core (A6) configurations, combining “Jaguar” x86 Central Processing Unit (CPU) cores with Graphics Core Next AMD Radeon™ HD 8000 Series graphics. 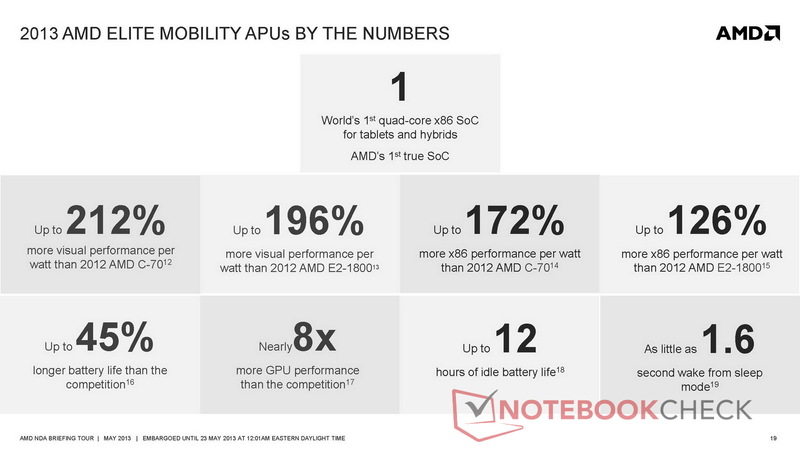 Up to 172 percent more CPU performance per watt and up to 212 percent better graphics performance per watt than its predecessor1,2, and up to 12 hours of resting battery life3. 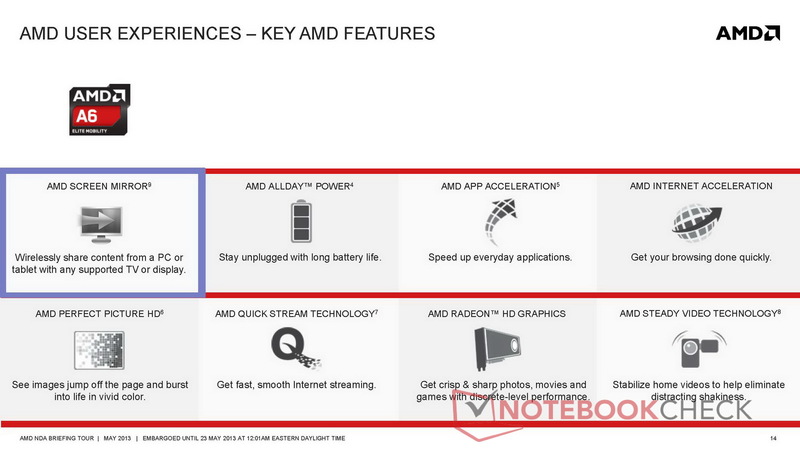 Up to 45 percent longer battery life and nearly five times more GPU performance than the competition4,5. 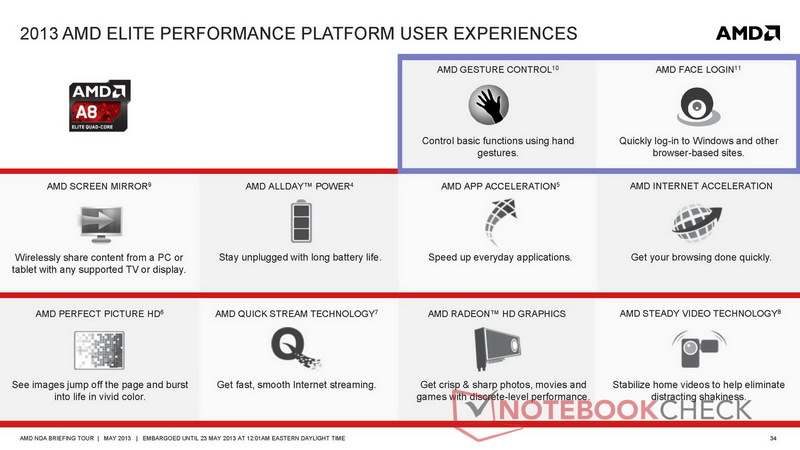 Best-in-class graphics and first-in-class x86 quad core SoC delivers the ideal balance between function and affordability for entry-level and small-form factor touch notebooks. Combine either two or four “Jaguar” x86 CPU cores with Graphics Core Next AMD Radeon HD 8000 Series graphics, enabling stunning visual performance and all-day battery life6. 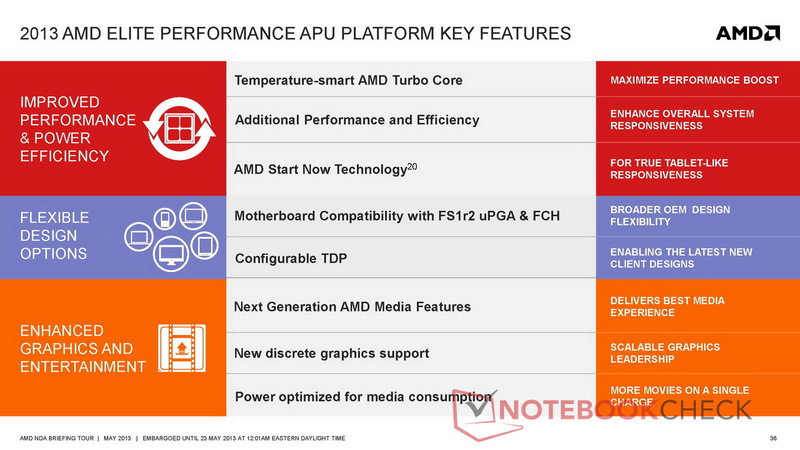 Quad core 2013 Mainstream APUs, a part of the 2013 AMD A-Series APU family (A4 and A6 models), are the first and only quad-core x86 solution for entry-level and small-form factor touch notebooks. 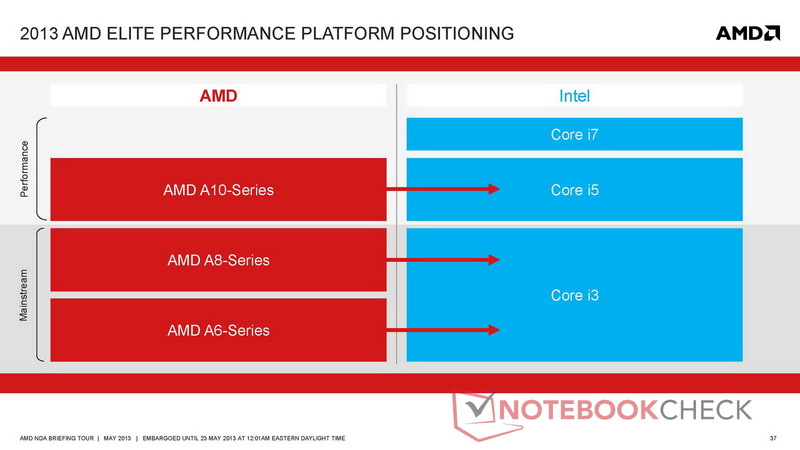 Dual core versions are AMD E-Series APUs, with E1 and E2 models available. Up to 132 percent better visual performance per watt and up to 127 percent better productivity performance per watt, plus up to 25 percent better power efficiency than previous generations7,8,9, with up to 11 hours of idle battery life10. 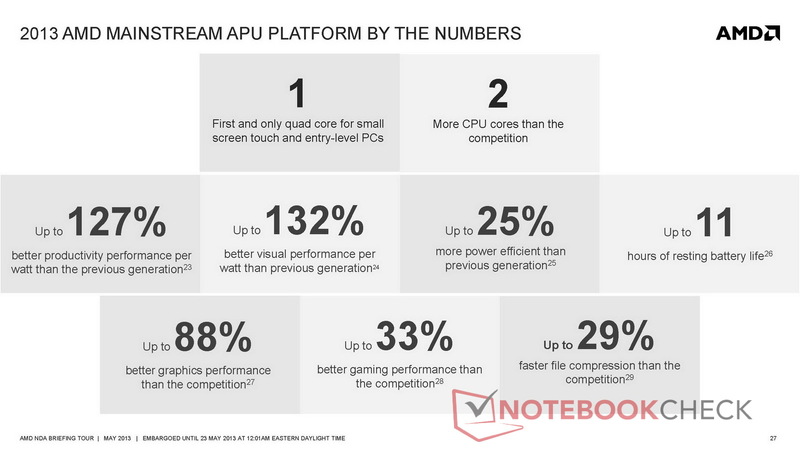 Up to 88 percent better graphics performance, up to 33 percent better gaming performance and up to 29 percent faster file compression than the competition11,12,13. 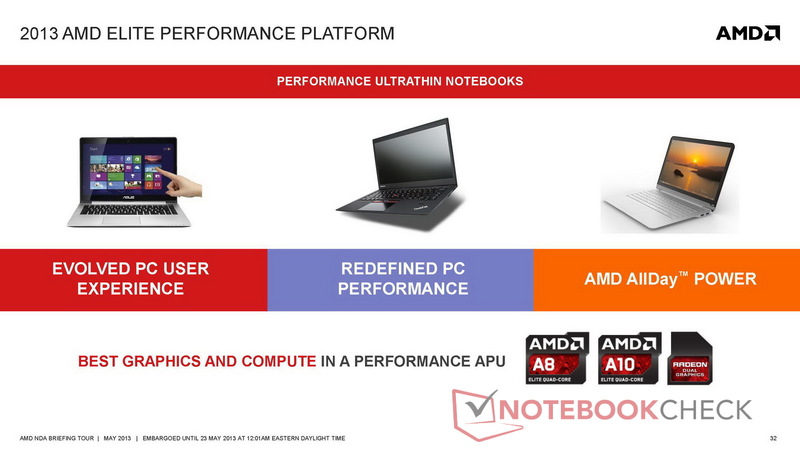 Top-of-the-line AMD A-Series APUs with A8 and A10 models that deliver the best graphics and compute in a performance APU, including elite performance and battery life, innovative features for the evolved PC user experience, and the most entertainment, all at a great value for premium ultrathin notebooks. 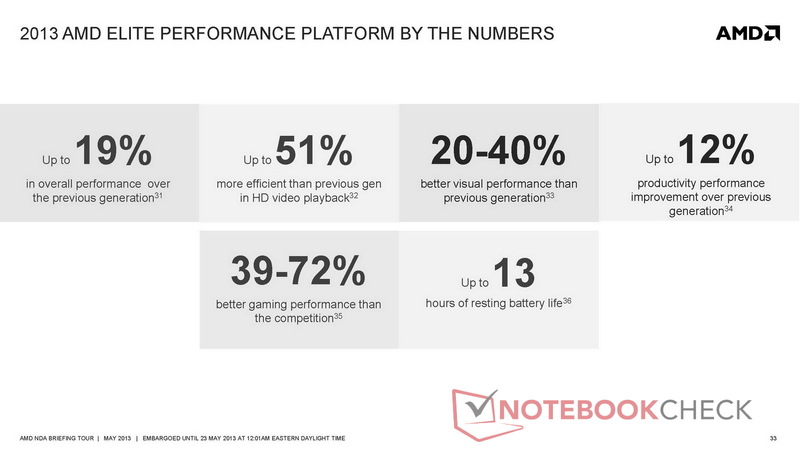 Up to 12 percent better productivity performance and between 20-40 percent better visual performance than the previous generation14,15, including up to 51 percent more power efficiency in HD video playback16 and up to 13 hours of resting battery life17. 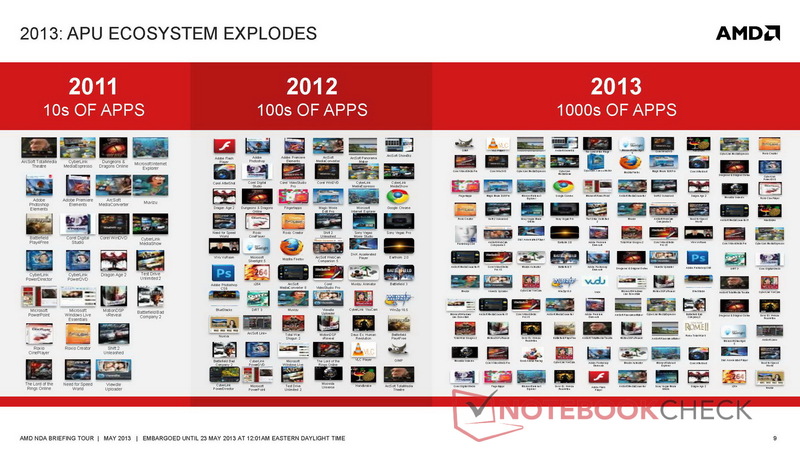 Between 39-72 percent better gaming performance on today’s leading games than the competition18. All AMD APUs are designed to deliver the best user experience for the computing activities that matter most to consumer today. 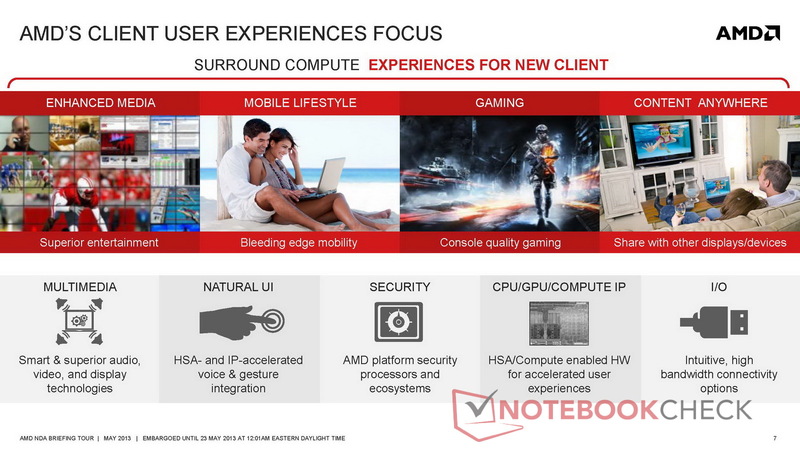 AMD is uniquely positioned to do this due to its breadth of experience that spans not only the traditional x86 compute architecture that’s best suited for productivity-focused tasks like word processing and spread sheets, but also graphics processing for today’s new user interfaces, and media- and graphics-intensive workloads. 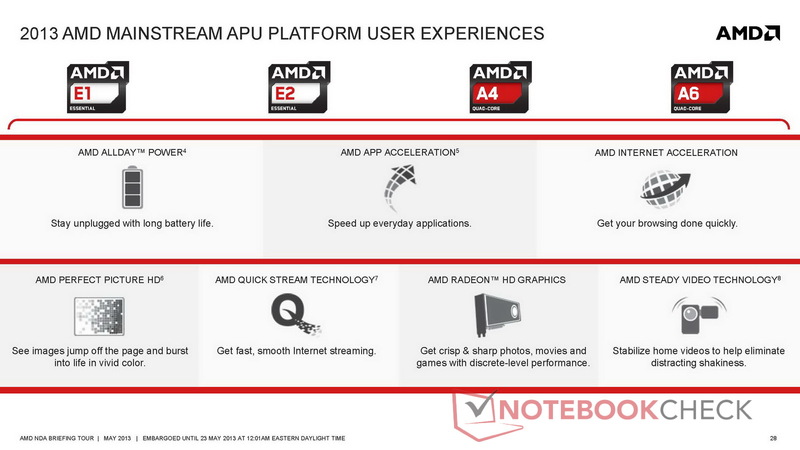 And the three new AMD APUs announced today offer a multitude of features related to looking at, and interacting with, mobile devices in a new way. AMD Screen Mirror21 — Wirelessly share content with any supported TV or display. AMD Radeon™ Graphics with DirectX® 11.1 support — Enjoy discrete-level performance for crisp & sharp photos, movies and games. AMD Dock Port — Use up to four external monitors and sync to other devices through a single connection. 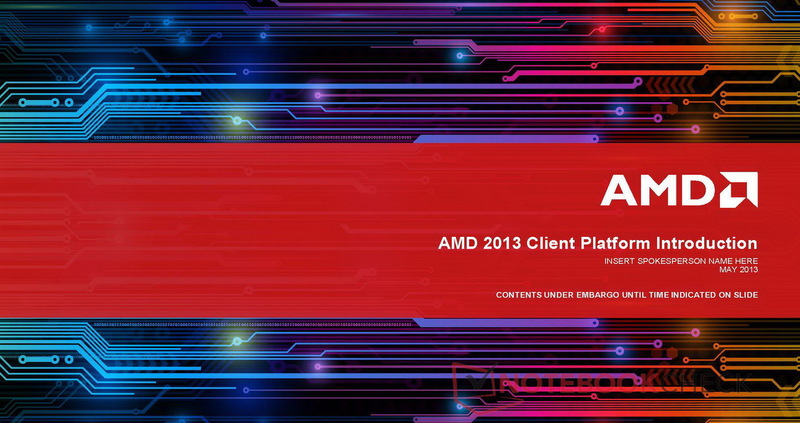 AMD AllDay™ Power — Stay unplugged with long battery life. 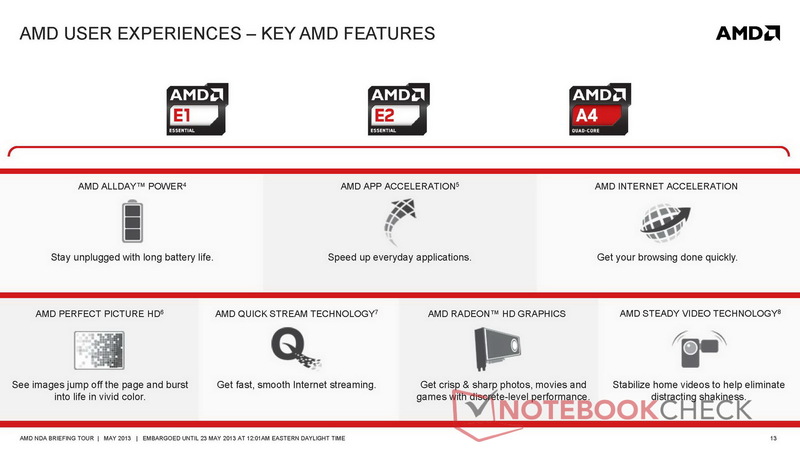 AMD Start Now technology22 — Boot up or resume from hibernate in seconds. 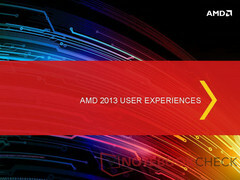 Visit the 2013 AMD Mobility APU landing page for videos, photos and more. 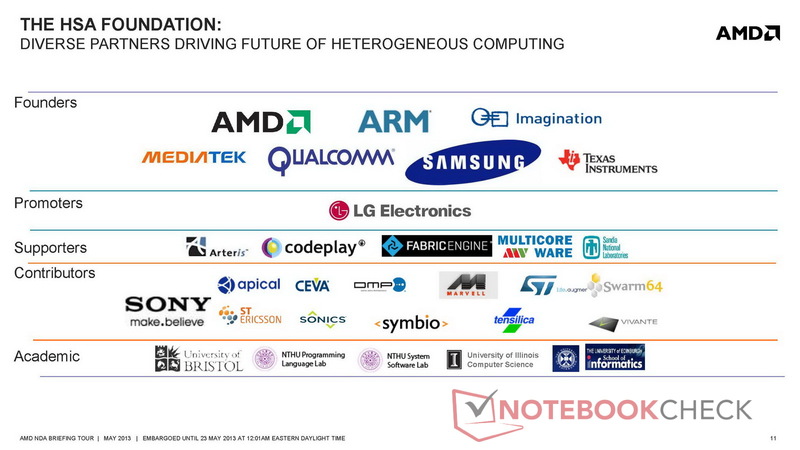 Read a blog about AMD’s unique market position. 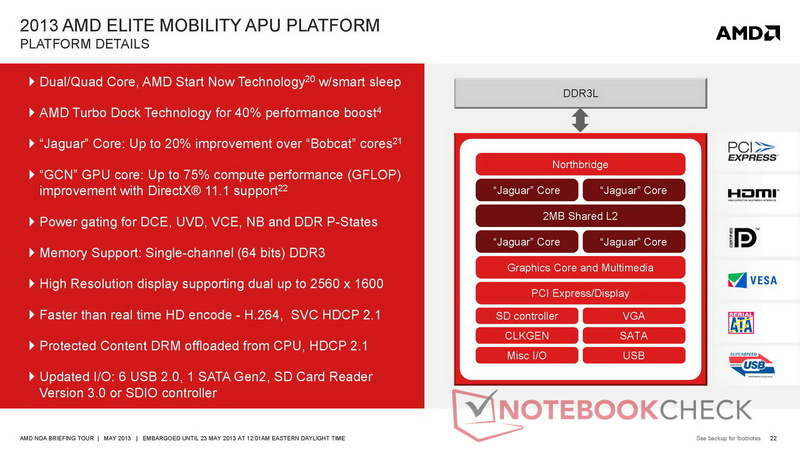 Watch a video about AMD’s 2013 Mobility SoC APU Architecture. 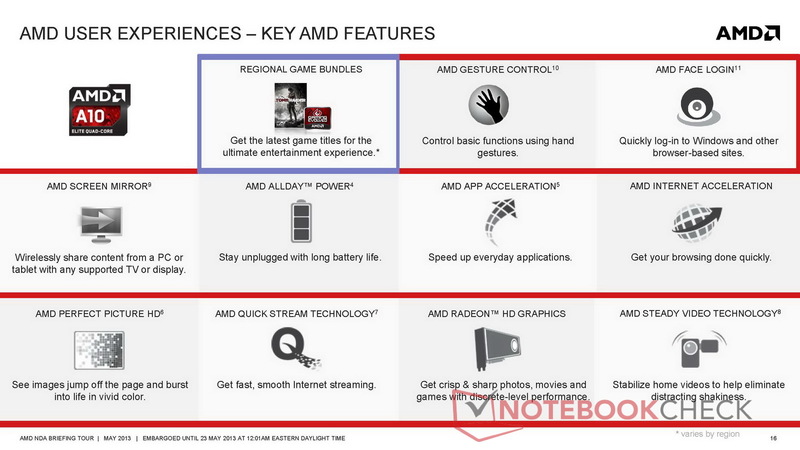 Find more product information at AMD.com. 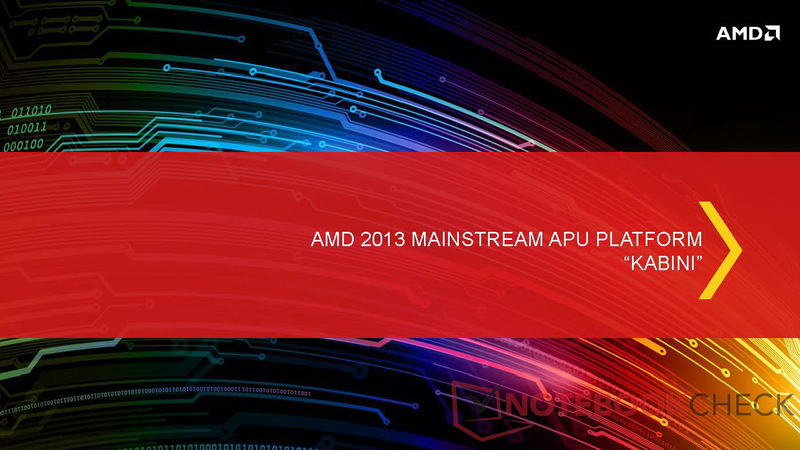 Follow all news from AMD on Twitter @AMD_Unprocessed.